Spherix (SPEX) continued to soar on Wednesday after shares of the intellectual property development company exploded on Tuesday. NEW YORK (TheStreet) -- Spherix (SPEX continued to soar on Wednesday after shares of the intellectual property development company exploded on Tuesday. Spherix surged Tuesday after the U.S. Senate and Senate Judiciary Committee Chairman Patrick Leahy removed a patent reform bill from the committee's calendar due to a lack of bipartisan support. Leahy, a Democrat, said many of the proposals in the bill would place too much of a burden on "legitimate patent holders who employ thousands of Americans," according to Spherix's press release. "The removal of this bill from the Senate Judiciary Committee schedule should remove some of the uncertainty which has been clouding our industry," said Spherix CEO Anthony Hayes. "Spherix is committed to responsibly protecting the patents it owns, and we remain eager to work with companies large and small to reach fair agreements." 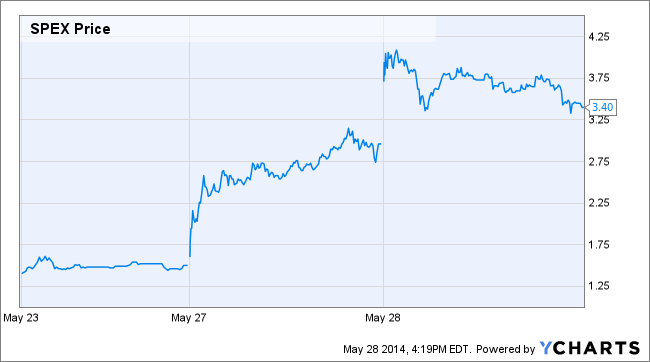 The stock closed up 16.5%, or 49 cents, to $3.95. Nearly 31 million shares changed hands, which eclipsed the average volume of 1,468,370. The stock had a range of $3.30 to $4.15 for the day.